Archaeological research shows that our prehistoric ancestors built resilience into their food supply. Now archaeologists say ‘forgotten’ millet – a cereal familiar today as birdseed – has a role to play in modern crop diversity and in helping to feed the world’s population. Over half of the food consumed by the human race in terms of calories comes from just three species of grain – wheat, rice and maize – yet in biological terms all are highly unnatural. They’ve been bred, generation after generation, to have grains that are super-sized in relation to their stems. This is perfect for maximising crop yields and profits, but not so perfect if growing conditions change in a changing climate. 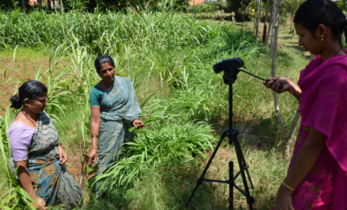 Professor Martin Jones, Head of Cambridge’s Department of Archaeology and Anthropology, is far more interested in a group of around 20 species of small-grained cereals that are generically termed millets. They look like wild grasses, don’t need much water, grow quickly and have a good nutritional balance. Yet, until recently, they have been largely overlooked by the Western world as a food source for humans, and are most commonly found in packets of birdseed. 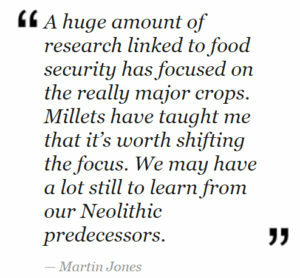 Now Jones has brought attention to this ancient grain as a means of mitigating against the boom–bust nature of harvests. 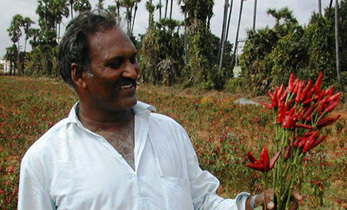 His work has contributed to a growing market in Asia for high-quality millet from Aohan, Inner Mongolia, and the cereal’s potential is attracting interest from big multinational companies. All of this has come from Jones’ archaeological interest in ancient farming practices. Searching for evidence of millet in the Neolithic, he discovered two key species – broomcorn and foxtail millet – in the prehistoric crop record in Europe, despite both being botanically East Asian. By piecing together the archaeological evidence, it became clear that Asian millets were coming into Europe, and that wheat and barley from Europe were moving into Asia. “This wasn’t a time when farming was transitioning from hunter-gathering to agriculture,” says Jones. 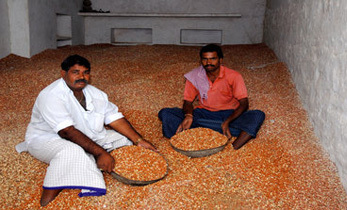 “What we were seeing was a move from single-season, single-crop agriculture to multi-season, multi-crop agriculture.” Hundreds of years ago the Asian millets were being used in flexible and innovative ways, and became among the most geographically widespread crops in the world. 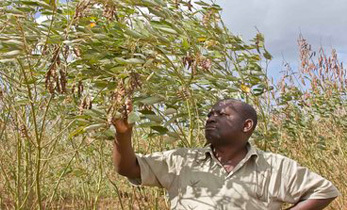 By using crops from other regions, the farmers could add another growing season and significantly increase their yields. Jones’ archaeological work took him to a new site in Aohan when evidence emerged of local millet cultivation in Neolithic times. There, his Chinese colleagues found carbonised particles of foxtail and broomcorn millet dating from 7,700 to 8,000 years ago, which proved to be the earliest record of their cultivation in the world. 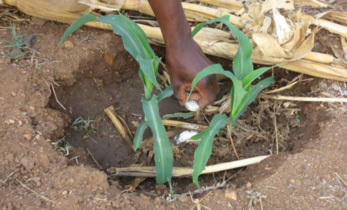 For farming systems where there’s no financial infrastructure providing subsidies and grants to help farmers control the growing conditions through irrigation, pesticides and other methods, inherent crop resilience can be vital to a successful harvest. After his work demonstrated the importance of the Asian millets and their origins in northern China, the Food and Agriculture Organization of the United Nations recognised the Aohan Dryland Farming System as a ‘Globally Important Agricultural Heritage Systems’ site. Aohan millet is now badged as a high-quality product and sold in large quantities to the domestic Chinese market, where it is a staple food. This year, Jones was among those awarded a medal from the Aohan government, not only for raising the profile of Aohan millet but also for helping the farmers to turn around the fate of this once overlooked crop, with support from their local government. Given the increasing number of extreme weather events, and a growing population demanding a more varied diet, the world is facing a potential crisis in terms of food security. 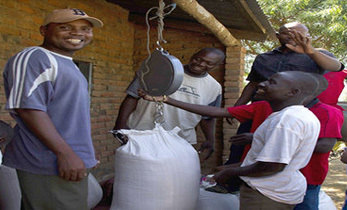 Aid agencies in Africa are becoming more aware of the practice of growing millet alongside the central maize crop as a safeguard against total harvest failure and are supporting farmers in Africa to continue to do this. And UK producers are showing interest in millet as a raw ingredient in branded consumer foods to help people improve their health and wellbeing. Research funded by the European Research Council, the Natural Environment Research Council, the Wellcome Trust and the Leverhulme Trust.